Dr. Lufburrow resides in Salado, Texas and is married to his wife, Debra. They have two married children: Blake and Erin and six grandkids. They enjoy traveling, working around the house and spending time with their pets. He is currently a member of the Salado United Methodist Church and recently authored a mystery novel, Crown Deception, in which a sequel is currently in the works. Dr. Lufburrow graduated from Baylor University(1977) with a degree in Biology. 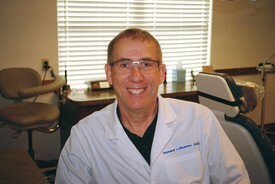 He completed his DDS degree at the University of Texas Dental Branch at Houston(1984). He has been a member of the Academy of General Dentistry since 1984 and in 1996 he was awarded the Fellowship in the Academy of General Dentistry. He also has been awarded a Fellowship in the International Congress of Oral Implantologists for his work in Implants.